If you are Canadian and enjoy listening to Bach, then you know who Glenn Gould is. My first encounter with Glenn Gould was watching him on TV as a child and wondering why that strange man was so close to the piano keys and why he was humming so loudly as he played. As my musical education continued, I realized that Mr. Gould was so good he could do whatever he wanted, unlike me, who would never excel at playing Bach no matter how loud I hummed (I'm more of a Debussy person anyways). Originally, Patricia asked me to combine Chris' two major likes, Glenn Gould and NFL football into a birthday cake which caused me to scratch my head repeatedly in artistic bewilderment for several weeks. Luckily, his Minnesota Vikings were defeated and that allowed me to concentrate solely on Mr. Gould. 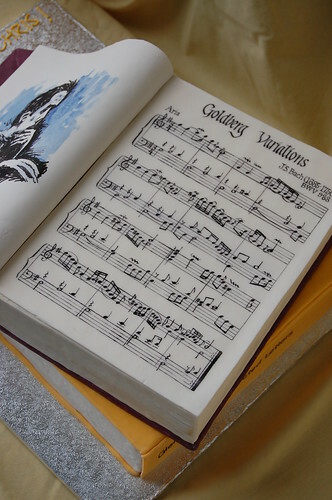 Using books as the main structural elements of cake allowed for easy construction which gave me more time to focus on the decorative elements which showcased the piano virtuoso and his most famous recording, the Goldberg Variations. The cake flavours were identical to their wedding cake, vanilla cake, lemon curd, and white chocolate lemon mousseline. Two thin sheets of gumpaste were dried out for a week, one flat and the other curved like an overturned page. Using my calligraphy tools and edible colouring mixed with vodka as ink, the first 16 bars of the Aria from the Goldberg Variations were carefully inscribed. The last two bars were a little squishy but otherwise, the sheet music was quite beautiful to look at. 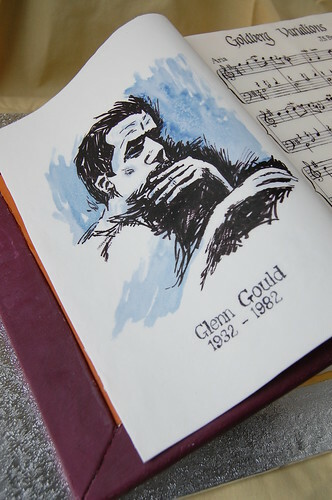 Glenn Gould's portrait was reproduced from an original work by artist Drew Hewitt using a brush and edible colour marker. Personally, I love working with dried gumpaste as a medium because it allows me to finish major components ahead of time with very little assembly needed on the day of delivery. Plus, these elements can be easily removed before cutting and serving the cake, which means it never has to be eaten and potentially, it could be kept intact for years. Undoubtedly, buying an edible ink printing system would be the less labourious choice, but what would be the fun in that?! The world has come to Vancouver and I am proud to say that I have Olympic fever. I have been febrile since receiving my tickets to three events in the mail back in December! 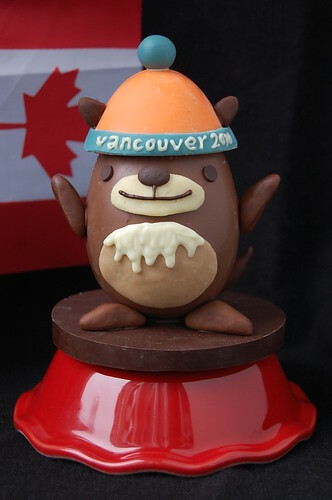 Despite the ups and downs of life which has curtailed my blogging spirit lately, the Vancouver 2010 Games have boosted my creative juices, producing a chocolate Mukmuk constructed from mostly chocolate and some chocolate modeling paste. For those uninitiated to the Vancouver 2010 Olympic mascots, Mukmuk is technically an Olympic "sidekick", who is an endangered Vancouver Island marmot. Because Mukmuk is Eric's favourite, this chocolate version was his Valentine's Day gift! I doubt Mukmuk will be eaten any time soon. Don't you love his chest hair? Yesterday, we waited over three hours in line to touch the Olympic medals (while wearing special gloves) and as I write this, thank God, the Canadian Men's Hockey team finally beat Switzerland in a shoot-out! Go Canada go!! !